The drill bit is made from HSS (hi-speed steel) and is precision fully ground at 135° with a split point. The drill bit can be used to drill materials such as iron, steel, non-ferrous metals and plastics. Standard HSS 118° angle point drill bits are designed as an all purpose drill bit and it will cut most materials. 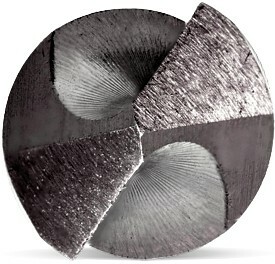 Industrial HSS 135° angle point drill bits are designed to cut metal. The split point adds 2 extra cutting edges with the adantage of reducing the amount of pressure required to perform the cut.